It's official now...I am in my mid-30's. I don't really mind this ... well, that's not entirely true. I've come to realize recently that I am no longer considered a young person. ..or a recent grad...or even a young mother. I am a mother of young children, I graduated many years ago and well, (as a friend pointed out) I must start checking a new age group box on survey forms. But to be honest, I am so blessed and so happy with my life, I really don't mind this birthday nor dread any ones coming after this one. 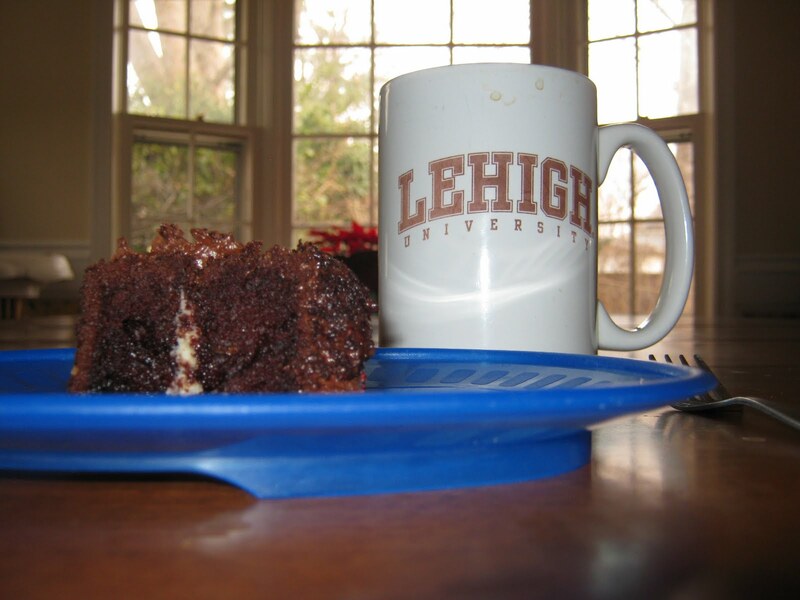 Mmm...chocolate cake and coffee. Life is good! PS - I will have to post a picture of my birthday cake later today. Andrew & Mark made me an absolutely awesome cake this past weekend. I will be sure to post a picture and recap my lovely day celebrating my "false birthday". 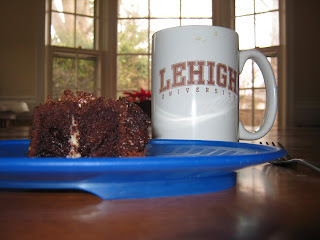 Every January the blogosphere is always flooded with posts about New Year’s Resolutions. I don’t typically make resolutions. But, I have set two goals for myself for 2011. And I’m proud to say that I got working on these goals before January 1. This summer I finally found out why my knees have been bothering me so much for the past two years. Possibly due to many years of playing basketball, the cushioning around my knee cap has deteriorated so that my bones are rubbing against each other causing early-onset arthritis. The condition was technically diagnosed as chondromalacia. This meant I would need to forego running and find other cardio workouts to strengthen my leg muscles specifically my quad muscles. I am thrilled to have finally tried spinning. I joined a new gym in October and I’ve been to several classes in addition to working out on my own. Spinning has proven to be a fantastic workout. I’m very excited about it. So, that is goal number one – get in better shape, regain core fitness and improve leg strength. Goal number two was to find a way to bring some income into our household. For some time now, I’ve been mulling selling my handmade crafts. For a couple years now, I’ve been making stenciled tee-shirts and onesies as gifts for my nieces, nephews and friends’ babies. As I was ruminating on what I might sell, my mind kept coming back to these. So, in November, I finally took the plunge and opened an online store through Etsy. The store is called Brush & Paint. I hope you’ll take a look. 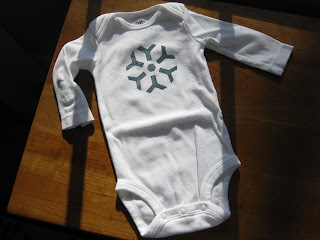 Initially, I have been stocking it with my hand-stenciled t-shirts and onesies. 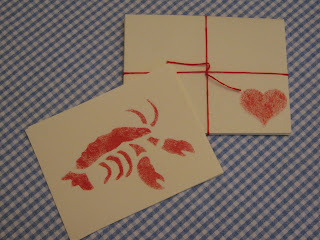 Last week, I added some stationery for Valentine’s Day. I’m very excited to finally be underway with this idea that has been in the back of mind ever since I became a stay-at-home mom in 2006. I have had some early success selling my t-shirts and onesies to family and friends. I hope to gain some traction in the online marketplace over the next year. Who knows what 2011 will have in store for me? Come 2012, I hope to be looking back at 2011 proud of the work I put into these two goals. Sitting here, right now, I’m feeling optimistic and I’m very excited by the possibilities. So, I don't think this counts as one of the "joys of motherhood" but, it is one of those moments that can define motherhood (or really any caretaker of small children's 'hood). Let me set the scene for you. Jay started taking a true interest in potty training last week. I was thrilled since it was his idea and it seemed to come to him out of the blue. He's been doing really well but, as is normal, I've been living in a perpetual state of anxiety about when he might have an accident. Andrew has been under the weather for over a week with a cough and runny nose. So, it's just been one of those weeks where I felt like I was bouncing back and forth from the bathroom to the tissue box to the fridge for more juice etc. Yesterday, Andrew started having diarrhea. Hoping this was just a result of something he had eaten I figured it would just run its course. And towards the end of yesterday I was feeling really confident in my prediction. Well, this morning he had two more bouts of it. Here's where the defining moment occurs. This morning, while I was researching causes for diarrhea online (and choking back my gag reflex at the detailed information concerning such a topic), Andrew appears by my side and says, "Mom, Jay has something in his hand and it smells like poop." I rush downstairs to see Jay holding a large amount of poop in his hand. I wish I hadn't said this but, I said, "Oh, Jay!" at which he turned and immediately dropped the turd to the carpet so as not to get in trouble for having it in the first place. I think this is one of those times where you need to either laugh or cry. So, I laughed...much later...once I had cleaned the child, my hands, the carpet, the toys that were on the carpet and my hands again! And to think earlier this week I was saying that I was tired of wiping runny noses. Oh, how I long for the days of runny noses!